Since the 1960's, the Soviet Union has been practicing what we now call, Plyometrics. The Soviets had been successful in the use of Plyometrics in their training regimes. The results showed in jumping events. It wasn't until 1975, when Fred Wilt, former Olympic runner, used the term Plyometrics in North America. The Russian Yuri Verhoshansky could very well be called the "Father of Plyometrics". He has been the leading researcher and coach most recognized with the spread of Plyometrics, for more information look at any of his works. - Always warm up and stretch especially the legs. - Explosive movements are required for optimum results. - Correct foot placement is essential. - Adequate recovery between reps can not be stressed enough. - Use only your body weight when performing plyometric exercises. - Keep your body balanced. - Avoid damped landings; use sprung floors, dry grass or an athletic track. Warm Up: An absolute must prior to doing this circuit. 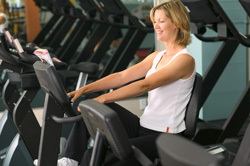 Spend 5 –10 minutes working gradually on an exercise bike, or fast walk / light jog. Follow this by a further 5 minutes of skipping, before stretching, especially your quadriceps and calf muscles. Ricochets: Staying on the balls of your feet, make rapid moves forward keeping your feet together, jumping only a few inches both forward and upwards. Aim for 3 sets of only 5 – 10 meters, with 30 - 60 seconds rest between sets, then walk / light jog for 2 minutes before next exercise..
Alternate Leg Bound: Aim for both good height and distance, using your arms for extra power. Change the leg after each landing, 3-5 sets for 20-30 meters, rest as above. Double Leg Bound: Aim for both height and forward motion, whilst landing on both feet, (on your toes), explode off again immediately on landing and repeat. Concentrate on your landing, not squatting down to far. Perform 3 – 5 sets of 6 –8 jumps, rest as above. Skipping: Aim to spend as much time in the air as possible, using your arms to gain extra height. Alternate your leg upon landing, thrusting the leading leg upward towards the chest and slightly forward. Perform 3 sets of 20 – 30 seconds then rest for 30 seconds between sets. Cool Down: by fast walking, taking long strides, and pushing up with your toes in order to feel a stretch in your calf muscles. Spend at least 10 minutes on stretching your legs, as the muscle fiber’s will certainly feel sore. Power Training for Sport: Polymerics for Maximum Power Development. Tudor O. Bompa, PhD. Coaching Association of Canada, 1996.